Whenever I hear somebody speaking in the name of God (regardless of whichever god he speaks for), I surely will be meticulously invited, all ears and with gusto, I will listen. This has been my attitude since I got hold of the Bible. (1 John 4:1) Beloved, believe not every spirit, but try the spirits whether they are of God: because many false prophets are gone out into the world. The Bible also pushed me to be investigative of other books used as religious textbooks of each religious group that now exist. (1 Thessalonians 5:21-22) Prove all things; hold fast that which is good. Abstain from all appearance of evil. I have traveled upon miles and miles of documents and places; and was forced to have as study of a little bit of science, history, culture, and traditions of great world religions. In all these, there is a paradoxical feeling in me which I do not understand. While I am reading a particular religious book, which I wanted to digest, there is that feeling that bores me and tries to stop me, which I never experienced in reading the Bible. Nevertheless, my search for truth and justice obliges me to do so. …Now the just shall live by faith: but if any man draw back, my soul shall have no pleasure in him. God is not pleased with anyone who started a good work, and drew back. Wisdom and understanding is promised to somebody who does the pleasure of the Lord. 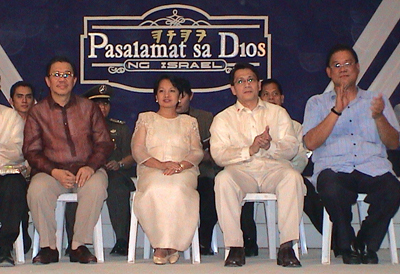 From left to right: Brother Eliseo Soriano, with the President of the Republic of the Philippines, Gloria Macapagal-Arroyo, when the latter visited one of the Thanksgiving ceremony of the Members of the Church of God, International or MCGI (which is presided by Bro. Eli) on Apalit, Pampanga to talk to its hundreds of thousand members. Beside GMA is MCGI’s Vice-Presiding Minister and host of the newest and most talked about morning show “Good Morning Kuya”, Brother Daniel Razon. Beside him is Presidential Advicer for Religious Affairs, Mr. Dodi Limcauco. 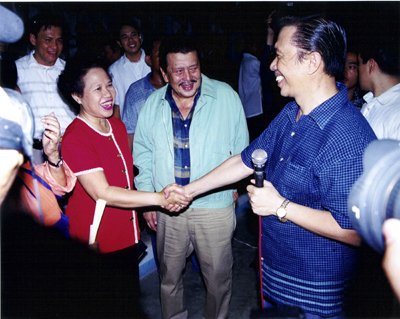 Brother Eliseo Soriano shaking hands with Senator Miriam Defensor-Santiago. On the middle is former President of the Republic of the Philippines, Joseph Ejercito Estrada. This photo was taken when the two politician visited Brother Eli to ask for its support of the then upcoming elections. As I go, along the way, I have met almost all kinds of people — believers and non-believers. I have felt the love and compassion of Godly people, and the hatred of the unbelieving. I was stoned so many times. I was beaten by five goons after a public debate. I was held in prison for ten hours for a charge I am totally innocent of (God is my witness). I escape a group of mobs traveling at the speed of 180 km/hr to save my comrades and myself of their cruelty. I was reminded of the fate of the Apostle Paul. In my preaching sessions, I was privileged to meet the rich, the educated, the poor, and the illiterate, and even the sick (mentally and physically). (1 Corinthians 9:20-22) And unto the Jews I became as a Jew, that I might gain the Jews; to them that are under the law, as under the law, that I might gain them that are under the law; To them that are without law, as without law, (being not without law to God, but under the law to Christ,) that I might gain them that are without law. To the weak became I as weak, that I might gain the weak: I am made all things to all men, that I might by all means save some. Some ask for prayers and many for healing; but I am not like Benny Hinn, Jimmy Swaggart, Morris Cerullo, Jim Bakker, and the like, that promise healing, but choose the kind of people they are going to heal. I oftentimes advice the sick to pray turn to spiritual and natural (fasting and nutritional healing) method; and to use homeopathic and alternative therapies, even, sometimes, urine therapy. I seldom recommend them to see conventional doctors using conventional medicine. In all these experiences, I noticed something, everywhere I go, in most of those I have listened to, with most books I have read, and I must tell you frankly and honestly, fraud and deceit is almost everywhere, and with most everybody, preachers, priests, ministers, lawyers, judges, magistrates, and even medical doctors. This is what I have discovered from the truth in the Bible. (Revelation 12:9) And the great dragon was cast out, that old serpent, called the Devil, and Satan, which deceiveth the whole world: he was cast out into the earth, and his angels were cast out with him. (Job 9:24) The earth is given into the hand of the wicked: he covereth the faces of the judges thereof; if not, where, and who is he? These times we live in is described in the Bible as the end times. Never in the history of mankind did man see the increase of knowledge in technology and science that we are witnessing now. We are sure from the reality that we see that we are living in the end times. A collateral prophecy is unfolding before our very eyes. (Daniel 12:9-10) And he said, Go thy way, Daniel: for the words are closed up and sealed till the time of the end. Many shall be purified, and made white, and tried; but the wicked shall do wickedly: and none of the wicked shall understand; but the wise shall understand. Wickedness will surely abound at the end times, and will grow worse! (2 Timothy 3:13) But evil men and seducers shall wax worse and worse, deceiving, and being deceived. Imagine, a deceiver being deceived! The prophecy is concise. The word of God tells us the truth. It will reveal to us the camouflaged lies deceit and fraud in this particular epoch of human history. My curious readers may ask me: Fraud? Deceit? Even with medical doctors and judges? These men are educated men. Men of wisdom and knowledge. Must their wisdom be doubted? (1 Corinthians 2:6-8 ) Howbeit we speak wisdom among them that are perfect: yet not the wisdom of this world, nor of the princes of this world, that come to naught: But we speak the wisdom of God in a mystery, even the hidden wisdom, which God ordained before the world unto our glory: Which none of the princes of this world knew: for had they known it, they would not have crucified the Lord of glory. Deceit and fraud is not a thing of make believe among lawyers, but judges and magistrates? I invite you to travel with me in time with all the people I met and with all the books I have read on my next article and decide for yourself if my conclusion is true. This entry was posted in atheist, bible, christianity, faith, God, health, Jesus, religion, salvation, spirituality, truth. Bookmark the permalink. Another eye opener for those who are not even aware that they are being deceived. Thanks be to God for His messenger that never sleeps in guarding all walks of our society for the knowledge of the Truth! God bless you Bro. Eli! This is only your introduction Bro. Eli, but really is enlightening and very interesting. You are truely God sent servant to enlighten the world. I can help but wait eagerly to read and travel with you to the conclusion of this blog. Yeah Sure, I will come along with your travel bro. Eli, to see how this world is being infected by so many teachings by false prophets, pastors, ministers, and priests that lead mankind to damnation. I have been regularly following your articles and blogs here on the web, and I’m getting really so many bits of wisdom and trivia also on some general informations I have never heard. I am excited to travel with you on your next article! Hope to meet the people you’ve met and read books you have read on your next blog. Its really true. And I believe that “Once Bro. Eli say it, He can prove it”. i have extended your invitation to my friends and relatives to visit your blog as well so they could likewise travel with you in time, to learn and acquire the knowledge you will share especially on this topic. Salamat po sa Dios sa isang Mangangaral na katulad niyo! We’re always excited of what are you gonna teach us because we know that you are sent by God to preach us His words…. you are HIS speaker…. another eye-opening post which will surely make people think. Truly an eye opener! Well, that’s the duty of a preacher sent by God. We are now in the last days, the perilous times. 2Ti 3:1 But know this, that in the last days grievous times shall come. 2Ti 3:5 holding a form of godliness, but having denied the power thereof: from these also turn away. I will travel with you Bro. Eli in your next article. All Aboard people!!! this will be a very enlightening journey..
one of the reason why God teaches us to be patient, is to prepare us for a much bigger event in the future. But to a very interesting subject matter, i cant wait to hear from bro.eli ASAP!. good health to you always bro eli!.we love you! How I pray that someone like you be with us alive until our Lord Jesus come (I Thes. 4:16-17). I will be your passenger upon travelling in your next article. We love you & we miss you here in the Philippines.. I will surely be one among your passengers. We enjoin all to come and travel with the most sensible preacher of our times – Bro. Eli. To God be the glory! And thanks to God that we have you Bro. Eli. WE THANK GOD THAT HE SEND A PREACHER LIKE YOU, NOT ONLY TO ENLIGHTENED THE PEOPLE INSIDE THE CHURCH BUT ALSO THE PEOPLE OUTSIDE WHO WANTS TO FIND AND KNOW THE TRUTH. WORDS ARE NOT ENOUGH TO EXPRESS OUR FEELINGS EVERYTIME YOU MAKE US UNDERSTAND THE MYSTERY OF THE GOSPEL WITH THE HELP OF GOD. MAY OUR GOD ALMIGHTY AND LORD JESUS CHRIST ALWAYS BE WITH YOU AND BRO. DANIEL. BRO. ELI, INGAT PO KAYO LAGI, MAHAL PO NAMIN KAYO KAHIT ANO PA SABIHIN NG ATING MGA KAAWAY. All costly treasures,physical and spiritual , are contained in Your message, there is nothing to be added because it is full. Anybody find them ,obey and treasure them is blessed in deed. count me in!!.. It is a pleasure and essential matter to discover, dig further for the truth in midst of our time especially if it will be led by the man sent by GOD. ‘cant wait to see those next articles. …another pedagogic and illuminating words of wisdom from the ambassador of God! Glory to God of Israel!!! Yes, the whole congregation in cebu is truly proud of you Brother Eli! But we are not proud your of works because your work is the product of your chances. But we are proud of your courage, because chances is the product of your courages. as destiny is not a matter of chances but rather it is matter of choice. and the choice is courage. Therefore, it’s the courage that make your work alive!. as being coward lead to being narrow minded. and being narrow minded leads to idle minded. look at in the game of CHESS, using the argument that all mens are created equal but why still white race is advantage againts black race. because white race has a courage, he is one move ahead. Both of you have your rewards already in the eyes of men! Let God alone speak for all our labors and perils we’ve encountered in fulfilling the words of the Lord! to all people who do not belong to our congregation…. i hope you have a little patience in the manner bro. Eli explains topics here….what is a little time compare to knowledge about our soul for the sake of truth and salvation?? I have noticed something about me…. I am a brethren in our congregation…I really love reading every topic you discussed here…but I have noticed something about me….when I begin reading every blog that you create…as I go along reading it in the manner how youve explains truth here…when I read your explanations..and after which you will support it with verses in the Bible; why is it I have this tendency not to read the supporting verses anymore? ?…is it because I know the verse already and heard it so many times from you?? do I commit sin if I have this tendency?? I hope we have more seekers of thruth come in here in our blog…. what rewards of men are you talking about? the troubles these 2 men encountered were not mentioned to attract praises of men but it was written to show the sacrifices one must endure to be a Christian. Come to think of it james, ARE PRAISES OF MEN MORE IMPORTANT THAN THEIR LIFE THAT THEY HAVE TO BE RISK THEIR LIFE JUST TO OBTAIN PRAISES OF MEN(REWARDS). Bro.Paul and Bro.Eli are not crazy and stupid to mentioned their sufferings just to attract praises.There is wisdom behind it that you guys unfotunately dont seeem to get in a deeper perspective.I pity you for your narrow mindedness. what rewards of men are you talking about? the troubles these 2 men encountered were not mentioned to attract praises of men but it was written to show the sacrifices one must endure to be a Christian. Come to think of it james, ARE PRAISES OF MEN MORE IMPORTANT THAN THEIR LIFE THAT THEY HAVE TO BE RISK THEIR LIFE JUST TO OBTAIN PRAISES OF MEN(REWARDS). >>Yes, for this individual EGO is their master. Humility is just a wishful thinking for them. They are not afraid of death as long as they can deceive. Beware of them! Bro.Paul and Bro.Eli are not crazy and stupid to mentioned their sufferings just to attract praises.There is wisdom behind it that you guys unfotunately dont seeem to get in a deeper perspective.I pity you for your narrow mindedness. >>> There is no wisdom in praising ourselves, the key is humility, humility, and humility. The real apostles did not mention their works, why? because they were instructed not to let the left hand knows what the right hand is doing, they fully comprehended that whoever boast for his labor will be humbled. i think you don’t know very well the person of st. paul and bro. eli. How could you say Paul did not walk on the old path. For you to say that you should first know what the old path is all about. Paul certainly walked in there until he finished his course. The path my friend are the Good works that God has ordained His people to where they should walk(Ephesians 2:10). And Paul’s writings are to teach by examples(I Corinthians 4:6), not as you have accused that he should be praise by man. as for Bro. Eli, he does not write these things to be praise by man. But these things are necessary as part of his duty to preach the Gospel of Christ to the whole world. the proof of his being the true messenger of God are the many souls that he has guided to worshipped God in the truest sense of it. This is not just a claim by a worthless man like me. You can visit our congregational gatherings and listen to bro Eli’s teachings if you want to try him(I Jn 4:1).Anytime and anywhere he is ready to answer any question regarding faith and to discuss it with anyone. So as a friendly advice acquaint your self to the person of Bro. Eli. I bet you the troubles, hardships that bro. eli might be citing are not a piece of his real life troubles. And I do believe like Paul, God have a waiting reward for Bro. Eli also. Thanks be to God for sending us Bro. Eli. Do you humbly believe that what you are saying is right? or what you have just mentioned is in accordance of God’s will? Just make sure your sermon does not hit you as well, because as you know you’ll be facing the same judgement. Also, for you to say that Bro.Paul and Bro. Eli already had their rewards in the eyes of men… you must know little or even nothing of their works. Such works, my fellowmen can never be rewarded by any praise from any man, even from all men firstly because it is not what they(Bro.Paul & Bro.Eli) seek. They want to live up to their purpose, the way God created them; walk the path created for them, to preach the truth. First, you must understand the context of the verse you are referring to… those who already received their reward actually did, because in their hearts it is what they seek. “they pray standing so that people will see them; when they give alms, they sound trumpets so that people will see”. These people did not do these acts because of faith, but merely because they want people to praise them, and what Christ said is true, they already have their reward, because that is what they intend to have. Intentions my friend, firstly that’s what counts. It is hard to be a preacher, it has so many requirements according to the Bible. I am not saying this to praise their perserverance to teach the truth even if more often than not, people do them evil in return, yet all my praises and gratitude i say to God that he gave and continually gives a helping hand to these people to pass all of these requirements and not give in to the corruption of this world, so that they can continue to preach the truth which is in the Bible. May God guide your ways, my friend. Think James… what have you done in this world that has equalled that of Brother Eli’s and Saint Paul’s good deeds? How dare you judge God’s preachers! You might think you’ve done this, that, etc., and you never told anyone… But what does God Have to say about your “deeds”? Read on, James… you’re a lost soul…. …i wish they can find you…’coz they don’t know what they’re missing…and i don’t know what i’ve been missing until i’ve heard you preached…thank you, and thank God always! Brod Eli,thanks for unmasking those false preachers. Bro Eli, you are the most active and most vocal preacher that will not stop unmasking the fraud and deceit being peddled by people who are pretenders to holiness and godly teachings. As a result the followers of satan invented criminal cases and connived with very big influential people in the Phillipine government to stop you from further destroying their fraud churches businesses, and we are sure you know that they would even go to the extent of killing you as what the Iglesia Ni Cristo ni Manalo members did with young students they killed in Bacood Sta Mesa, Philippines just for a basketball fight and whose mutilated bodies were later found floating in the Pasig river. A former member of the church who raped and molested other young members who initially confessed to his [her] crimes later on turned the table against you at the prodding of the INC of Manalo and manipulated by some DECEITFUL big guns at the Philippine Department of Justice. Inspite of all these persecutions, and risk to your life,you continue to shout and expose the FRAUD and DECEIT, maybe not to your own personal desire but in pursuit of the duties and responsibilities assigned to you by God. Go on Bro Eli and in our own little ways we will help as many of us were also victims of FRAUD and DECEIT by some corrupt government officials beholden to influential FRAUD church leaders. A lot of deceiver now, because it is the perilous time prophesied in the bible, both physical and spiritual aspects.